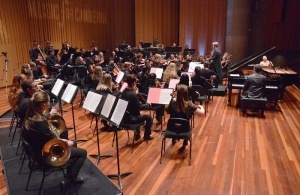 IN A thoughtfully programmed concert covering a century of music-writing by three composers whose lives overlapped, the Canberra Youth Orchestra, under the direction of Leonard Weiss, showed that the future of fine music-making is in good hands in Canberra. Sure there are aspects that need some work, but overall, this concert was delightful, energetic and entertaining. Gershwin’s “Rhapsody in Blue” is certainly iconic but Dr Edward Neeman, at the piano, gave it new life in one of the most imaginative interpretations I have ever heard. After a nice – and the very familiar – clarinet introduction, the orchestra was a bit scrappy from nerves at the start, but as soon as Neeman’s charming and confident playing started, it must have been enough to inspire the orchestra for it was not long before they settled into very empathetic accompaniment, particularly from the strings. The long sustained note at the end of the work, though, showed the orchestra was not properly in tune and this is one of the aspects that needs work. 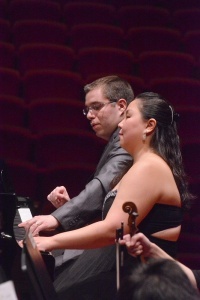 Neeman’s wife, Dr Stephanie Neeman, joined him on stage for Mendelssohn’s “Concerto for Two Pianos and Orchestra in E Major”. Here the orchestra seemed more comfortable with well-controlled direction from Weiss, bringing plenty of expression and a nicely-balanced sound. The soloists were as one in the many question/answer and echo passages in this very beautiful work. Their touches and tempi were perfectly matched as was their expression. They demanded – and got – excellent accompaniment from the orchestra. Dvorak’s Symphony Number 8, Op 88, another iconic work closed the concert, its four movements bringing out the best in the orchestra, including as to tuning – although still not perfect it was much better. There is a familiar bird call in the first movement; the flute played it nicely, although I would have preferred it to have just a little more prominence. In the third movement there’s a delightful folk dance in 3/8 time; Weiss was so animated he was almost dancing on the podium and the orchestra responded beautifully, keeping faithful to the time and rhythm. The trumpets, after struggling somewhat with the Gershwin and Mendelssohn, shone in the Dvorak, especially with the spectacular fanfare at the start of the final movement and then some pretty fancy playing from there-on-in. This was a very enjoyable concert from an accomplished group of young people.